Paul expanded on this when he wrote, “For I received from the Lord that which I also delivered to you: that the Lord Jesus on the same night in which He was betrayed took bread; and when He had given thanks, He broke it and said, ‘Take, eat; this is My body which is broken for you; do this in remembrance of Me.’ In the same manner He also took the cup after supper, saying, ‘This cup is the new covenant in My blood. This do, as often as you drink it, in remembrance of Me.’ For as often as you eat this bread and drink this cup, you proclaim the Lord’s death till He comes. Therefore whoever eats this bread or drinks this cup of the Lord in an unworthy manner will be guilty of the body and blood of the Lord. But let a man examine himself, and so let him eat of the bread and drink of the cup. For he who eats and drinks in an unworthy manner eats and drinks judgment to himself, not discerning the Lord’s body.” 1 Corinthians 11:23-29. The Lord’s Supper is a testimony. By partaking of it, I testify that Jesus’ body was broken for me and that He shed His blood for me. I thereby proclaim the death of ChristThis most often refers not to the physical death Christ died on the cross of Calvary, but to the death of the lust to sin in His human nature, which task He fulfilled while He lived on earth as a human being. (2 Timothy 2:11; 2 Corinthians 4:10; Philippians 3:10; Romans 8:3)... More. We are to do this in remembrance of Him. When I break the bread, I remember how His body was broken for me. When I drink of the cup, I remember that He shed His blood for my sake for the forgiveness of sins. I testify at the same time that I have also received this gift, or this grace. I do not partake of it in order to receive forgiveness for my sins, but because I have received the forgiveness of sins. God will not forgive me my trespasses if I do not forgive others their trespasses. (Matthew 6:15) “But let a man examine himself, and so let him eat of that bread and drink of that cup.” 1 Corinthians 11:28. I am not worthy to receive forgiveness if there is someone I cannot forgive. I testify against myself if I then drink of the cup. I pass sentence on myself. We are to walk in fear throughout the time of our sojourn because we have been redeemed from our aimless conduct by the precious blood of Christ. (1 Peter 1:17-19) Every person must examine himself whether he hates all aimless conduct; then he may break the bread and drink of the cup. I eat and drink unworthily if there is a fault in my life which I love and do not want to let go. He has given His blood to redeem me. I am judged, and I sinSin is anything that goes against God’s will and His laws. To commit sin is to transgress or disobey these laws. The lust to sin dwells in human nature. In other words, it is contaminated and motivated by the sinful tendencies that dwell in all people as a result of the fall into sin and disobedience in the garden of Eden. This... More against the body and the blood of the Lord if I want to hold on to my fault. “The cup of blessing which we bless, is it not the communion of the blood of Christ? The bread which we break, is it not the communion of the body of ChristThe body of Christ is made up of all of those who give their lives to serve God in order to come to the fullness of Christ. They work in the ministry that He has appointed them, which differs from person to person, for the edification of themselves and others to bring all to unity. It is made up of... More? For we, though many, are one bread and one body; for we all partake of that one bread.” 1 Corinthians 10:16-17. All those who break the bread testify that they do not serve themselves, but each other. By breaking the bread, I testify that I do not live for myself, but for the others, and that I am willing to accept all the help for salvation they can give me because we all eat of the same bread. Let each one examine himself, and then break the bread. Just as a member supplies the other members with all the strength and nourishment he draws from the body, so we too are to supply the other members with all the love, wisdom, strength, grace, mercy, patience, and faithfulness that we receive from Christ. If we are not willing to love, neither are we worthy to receive love. (1 John 4:11) If we are unwilling to be merciful, forgiving, easy to get along with, helpful, or forbearing, then we are also unworthy to receive these blessings. 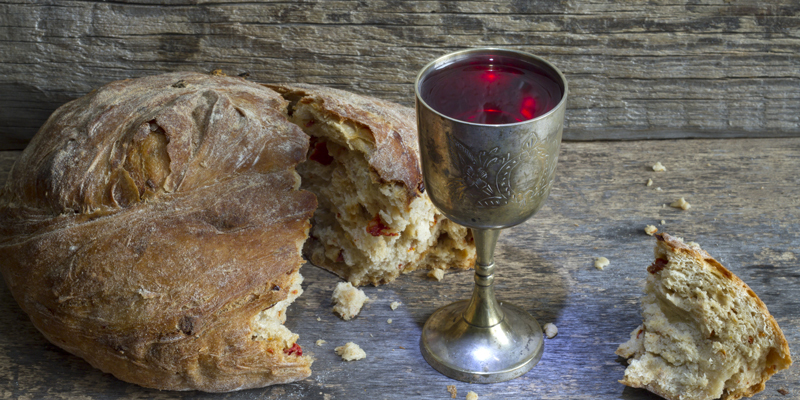 Let each one examine himself when he comes to the Lord’s Supper, and so eat of the bread and drink of the cup. You may be interested in reading more in our “Key Teachings” pages on disciple life and Christ manifested in the flesh. Being a ChristianBible studies and commentariesChurch lifeWhat does the Bible say?